Bikaner (Hindi: ??????? ( )) is a city in the northwest of the state of Rajasthan in northern India. It is located 330 kilometres (205 mi) northwest of the state capital, Jaipur. Bikaner city is the administrative headquarters of Bikaner District and Bikaner division. It was formerly the capital of the princely state of Bikaner. The city was founded by Rao Bika. in 1486 and from its small origins it has developed into the fifth largest city in Rajasthan. The Ganges Canal, completed in 1928, and the Indira Gandhi Canal, completed in 1987, facilitated its development. Prior to the mid 15th century, the region that is now Bikaner was a barren wilderness called Jangladesh. In 1488 Rao Bika established the city of Bikaner. According to James Tod, the spot which Bika selected for his capital, was the birthright of a Nehra Jat, who would only concede it for this purpose on the condition that his name should be linked in perpetuity with its surrender. Naira, or Nera, was the name of the proprietor, which Bika added to his own, thus composing that of the future capital, Bikaner. Rao Bika was the first son of Maharaja Rao Jodha of the Rathor clan, the founder of Jodhpur and conquered the largely arid country in the north of Rajasthan. As the first son of Jodha he wanted to have his own kindom not inheriting Jodhpur from his father or the title of Maharaja. He therefore decided to build his own kingdom in what is now the state of Bikaner in the area of Jungladesh. Though it was in the Thar Desert, Bikaner was considered an oasis on the trade route between Central Asia and the Gujarat coast as it had adequate spring water. Bika’s name was attached to the city he built and to the state of Bikaner (“the settlement of Bika”) that he established. Bika built a fort in 1478, which is now in ruins, and a hundred years later a new fort was built about 1.5 km from the city centre, known as the Junagarh Fort. Around a century after Rao Bika founded Bikaner, the states fortunes flourished under the sixth Raja, Rai Singhji, who ruled from 1571 to 1611. During the Mughal Empire’s rule in the country, Raja Rai Singh accepted the suzerainty of the Mughals and held a high rank as an army general at the court of the Emperor Akbar and his son the Emperor Jahangir. Rai Singhs successful military exploits, which involved winning half of Mewar kingdom for the Empire, won him accolades and rewards from the Mughal emperors. He was given the jagirs (lands) of Gujarat and Burhanpur. With the large revenue earned from these jagirs, he built the Chintamani durg (Junagarh fort) on a plain which has an average elevation of 760 feet (230 m). He was an expert in arts and architecture, and the knowledge he acquired during his visits abroad is amply reflected in the numerous monuments he built at the Junagarh fort. Maharaja Karan Singh, who ruled from 1631 to 1639, under the suzerainty of the Mughals, built the Karan Mahal palace. Later rulers added more floors and decorations to this Mahal. Anup Singh ji, who ruled from 1669 to 1698, made substantial additions to the fort complex, with new palaces and the Zenana quarter, a royal dwelling for wommen and children. He refurbished the Karan Mahal with a Diwan-i-Am (public audience hall) and called it the Anup Mahal.Maharaja Gaj Singh, who ruled from 1746 to 1787 refurbished the Chandra Mahal (the Moon palace). During the 18th century, there was internecine war between the rulers of Bikaner and Jodhpur and also amongst other thakurs, which was put down by British troops. Following Maharaja Gaj Singh, Maharaja Surat Singh ruled from 1787 to 1828 and lavishly decorated the audience hall (see illustration) with glass and lively paintwork. Under a treaty of paramountcy signed in 1818, during Maharaja Surat Singhs reign, Bikaner came under the suzerainty of the British, after which the Maharajas of Bikaner invested heavily in refurbishing Junagarh fort. Dungar Singh, who reigned from 1872 to 1887, built the Badal Mahal, the weather palace, so named in view of a painting of clouds and falling rain, a rare event in arid Bikaner. General Maharaja Ganga Singh, who ruled from 1887 to 1943, was the best-known of the Rajasthan princes and was a favourite of the British Viceroys of India. He was appointed a Knight Commander of the Order of the Star of India, served as a member of the Imperial War Cabinet, represented India at the Imperial Conferences during the First World War and the British Empire at the Versailles Peace Conference. His contribution to the building activity in Junagarh involved separate halls for public and private audiences in the Ganga Mahal and a durbar hall for formal functions. He also built the Ganga Niwas Palace, which has towers at the entrance patio. This palace was designed by Sir Samuel Swinton Jacob, the third of the new palaces built in Bikaner. He named the building Lalgarh Palace in honour of his father and moved his main residence there from Junagarh Fort in 1902. The hall where he held his Golden Jubilee (in 1938) as Bikaners ruler is now a museum. Ganga Singhs son, Lieutenant-General Sir Sadul Singh, the Yuvaraja of Bikaner, succeeded his father as Maharaja in 1943, but acceded his state to the Union of India in 1949. Maharaja Sadul Singh died in 1950, being succeeded in the title by his son, Karni Singh (1924-1988). The Royal Family still lives in a suite in Lalgarh Palace, which they have converted into a heritage hotel. The Junagarh Fort and its temples and palaces are preserved as museums and provide insight into the grandiose living style of the past Maharanas of Rajasthan. Rajasthani cuisine (Hindi: ) was influenced by both the war-like lifestyles of its inhabitants and the availability of ingredients in this arid region. Food that could last for several days and could be eaten without heating was preferred. Scarcity of water and fresh green vegetables have all had their effect on the cooking. It is also known for its snacks like Bikaneri Bhujia, Mirchi Bada and Pyaaj Kachori. Other famous dishes include Bajre ki roti (millet bread) and Lashun ki chutney (hot garlic paste), Mawa Kachori from jodhpur, Alwar ka mawa, Malpauas from pushkar and Rassgollas from Bikaner, "paniya"and "gheriya" from Mewar. 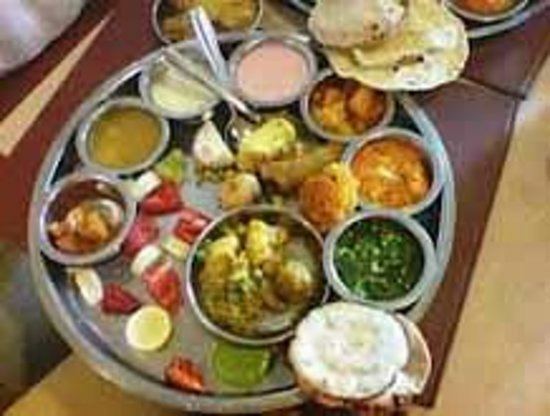 Originating for the Marwar region of the state is the concept Marwari Bhojnalaya, or vegetarian restaurants, today found in many part of India, which offer vegetarian food of the Marwari people.To decrease the use of water in this desert state they use a lot of milk and milk products to cook.